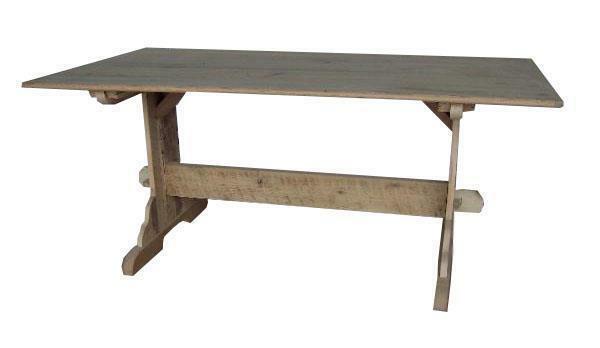 Classic country chic all the way when it comes to this Amish Trestle Dining Table. Whether you choose to paint it or finish in a natural varnish bringing out the natural beauty of the reclaimed wood, this trestle table will bring her the farmhouse style. Handcrafted from century old American Barnwood by our skilled Amish Woodworkers using superior techniques passed down through the generations. This reclaimed wood dining table is full of wisdom and stories, setting the scene each night as your family gathers around making memories of their own. Each piece of reclaimed wood, carefully selected with the original knot holes, saw marks and nail holes. Our woodworkers pay extra attention to detail and provide extra care to each piece of reclaimed wood as they work to preserve the 100 year old history. Give this old wood new life and celebrate our American history in your Amish Trestle Dining Table. 100 Year Old Barn Wood - Wood Type will Vary You can expect to see nail holes, cracks, saw marks, water marks, worm holes, sun spots, and dents as they are authentic and represent the natural characteristics of the wood. Our multi-step, hand-finishing process produces authentic, distressed looking patina on your furniture. Although color samples can be provided as a reasonable approximation, the end results typically do vary slightly from the samples. Our beautiful barn wood varies in tone and shade from orange to brown and light to dark and in size and texture. Please take note that although we produce a consistently beautiful product, we also strive to produce unique furniture; no two pieces will ever look the same. Custom Sizes Are Available. Please Call For Pricing.